298 pages | 40 B/W Illus. The book accomplishes a great fact-finding mission describing the consequences of right-wing populists in government for party competition. It begins the hunt for theory and finds new puzzles: The effects of radical right-wing government involvement are more complicated than anticipated. The book is an indispensable building block for any scholar dealing with this subject. In 2000 Hainsworth et al. noted that the extreme right was moving "from the margins to the mainstream." Fifteen years later, in a long-overdue but worthy 'successor' to Hainsworth's seminal volume, Akkerman et al. observe that radical right-wing populist parties have now solidly moved "into the mainstream". 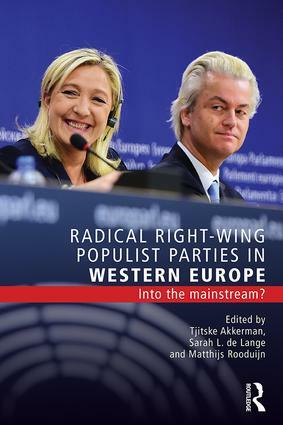 This book offers an updated and in depth analysis of case studies of right-wing populism and extremism, alongside the validation of a crucial hypothesis: have these parties conquered more of the political space of the moderate mainstream right? Thanks to an empirically grounded comparative survey examining the phenomenon, the authors demonstrate that, contrary to shared wisdom, the populist far right is still secure in its extreme position, and remains quite distant from other mainstream parties all over Europe. Moreover, underlining the fact that the gap between extreme and mainstream parties has only been narrowed where a critique of the European Union is concerned, the authors offer further hints to the sensitive topic of euro-scepticism. Tjitske Akkerman is Assistant Professor in the Department of Political Science at the University of Amsterdam, the Netherlands. Sarah L. de Lange is Associate Professor in the Department of Political Science at the University of Amsterdam, the Netherlands. Matthijs Rooduijn is a postdoctoral researcher and lecturer in the Department of Political Science at the University of Amsterdam, the Netherlands.